Players should know that any calls they make to this casino are recorded and may be used as evidence at the sole discretion of SlotsMagic. Gamers from Bulgaria and Slovakia are not allowed to play any games that fall in the live casino category. It is the gamblers’ obligation to check the legality of online gambling in their jurisdiction since remote betting is not allowed in some states. The maximum winning that players can cash out is ten thousand euros every thirty days. If a player wins a considerable sum of money, the cash will be withdrawn in batches of ten thousand every month until the full amount is removed. The transfer of funds from one player to another within the casino is strictly forbidden. Players found to be going against this rule may have their accounts suspended. From the gamer – A lot of information about a player is provided by the gamer. When signing up to this casino, players are required to submit details about themselves. This data is verified using proof supplied by the gamer in the form of ID card, driving license, or passport. Information is also collected directly from the player when he or she plays in the casino placing bets and using other functions like contacting the support team. Calls made to the casino are recorded and used as a source of information when the need arises. From the player’s device – SlotsMagic casino can collect information about the gamer’s device which in turn gives the casino more data about their users. Some of the information accessed through the player’s device is their IP address, hardware model, operating system and version number among other things. From cookies – Using cookie files, this casino can collect player’s information regarding their browsing actions and patterns. Information collected is not linked to one player though since the cookie file does not have a unique identity for all the gamers. Data transferred from cookies is from a player’s hard drive. Info collected through this method is mostly used for advertisements and to create a personalized user experience for members playing in this casino. From external companies – SlotsMagic Casino uses third party companies to cross-reference information submitted by players to ascertain if the accuracy of the details is provided. Since the casino admits players from multiple jurisdictions, several companies are used. In the process, the casino gets more information about players. The information collected is used to perform several functions that are beneficial to the gamer and casino. After going through the print, players can then decide if they are willing to share the information being asked for then proceed to sign up. Software is among the factors that contribute to the growth of an online casino. Software developing firms used by an establishment dictate the kind of games that players will find on the website. Software provider firms used by SlotsMagic are among those that have top-tier games that are well designed and have interactive features. These firms and others that provide software to this casino are among the best in the online gambling business. 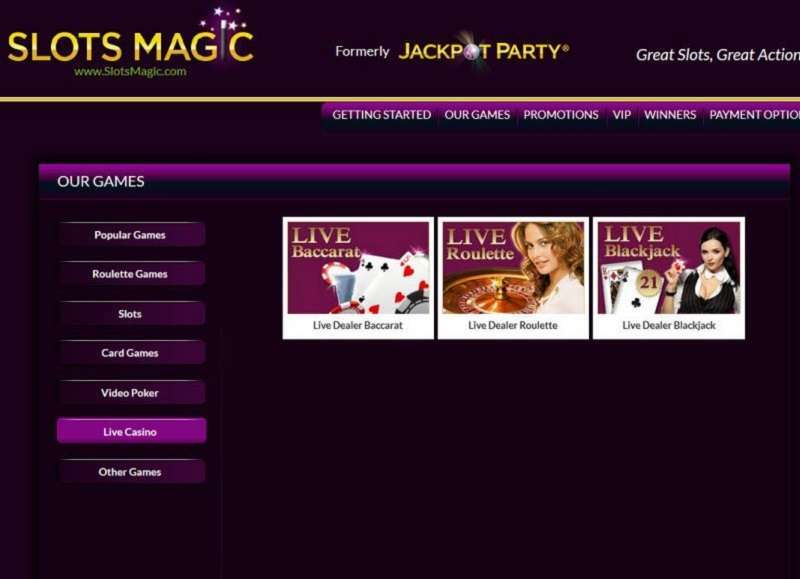 There are multiple game categories available in SlotsMagic Casino. Players with all kinds of interests are catered to by the numerous game categories provided. Some games depend entirely on luck while others require that players have prior knowledge of necessary gameplay rules. There are a variety of table games from the multiple software provider firms available in this casino. Players can choose a variation to play as dictated by their budget and know-how on gameplay rules. There are many other variations up on the website that players can interact with and place their stakes on. This category has a lot of games that players can play for real money or out of cost. Slot playability is smooth, and players get to be part of jackpots if the slot they are playing is part of the titles contributing to any active prizes. This category has several games that video poker fans can play. The titles in this collection may not be as extensive as the other categories, but it has been able to accrue and retain a considerable following. 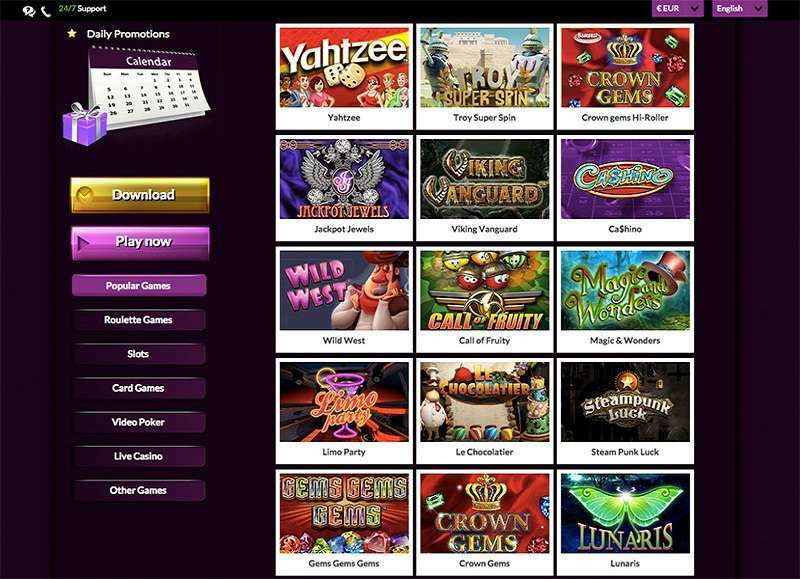 This selection of games rarely misses in most online casinos. Aces and Faces, among others. These video poker titles are available in single and multi-hands of up to twenty-five hands. Live dealer games try to replicate the atmosphere in brick and mortar casinos. Cinematography techniques and camera angles are explored to try and give the desired results. Videos are streamed live to the gamer wherever they are. Hardware and software used on the gamer’s end should be able to receive and project the video from the casino. Gamers are provided with multiple tables each with different staking limits for them to choose what works best for them. Skill and strategy are some of the factors that determine whether the gamers will beat the live dealer or not. When choosing a cashier option, players should consider the withdrawal time set on each system. Digital wallets take from twenty-four to forty-eight hours. Credit or debit cards take a maximum of five days while bank transfers take up to seven. Cheques have the longest withdrawal time of up to twenty-one days. Pending time is a maximum of forty-eight hours. Players are allowed to withdraw a total of ten thousand euros per month. Incentives given by an online casino is a strategy that has been used from time to time to attract new gamers and retain the old clientele. 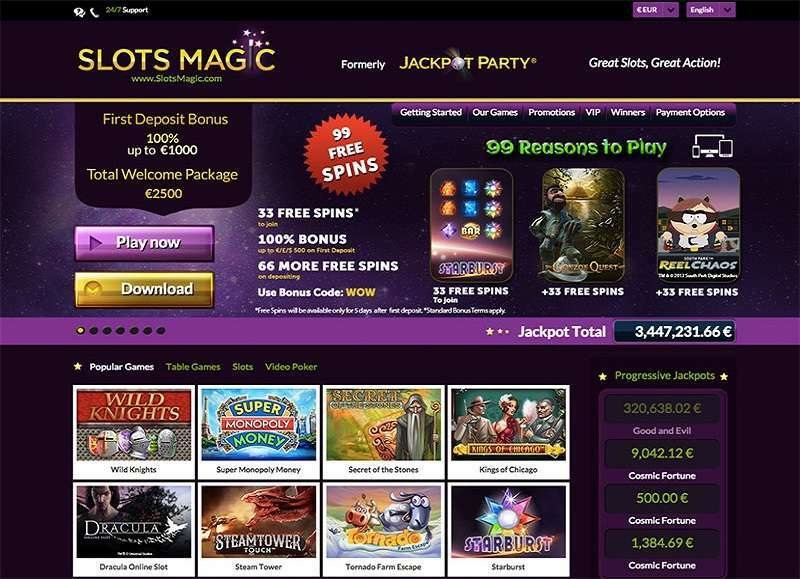 SlotsMagic Casino has a decent number of premiums that players can claim and use on their favourite games. 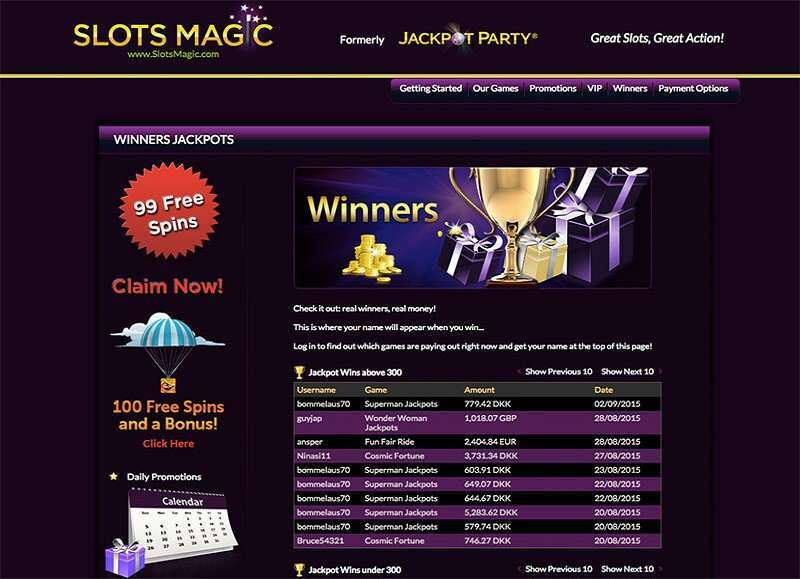 When joining this site, players are given a SlotsMagic bonus that serves to welcome them as official members. The welcome offer gives players a chance to claim a total of one hundred euros and fifty free spins. The bonus code “MAGIC” is to be used by gamers when they are claiming this reward. The reward is a one hundred percent match on the deposit that players make. Before claiming this reward, players should read through the bonus policy to understand how they are to use it. The terms and conditions provided must be adhered to if gamers want their withdrawal of bonus funds to be smooth. Virtual gaming destinations that are compatible with mobile devices are among those that have been able to amass a following since gamers have a wide range of platforms to access the casino including their cell phones. SlotsMagic can be accessed on the mobile applications provided for instant play or in its no download version. Players who do not wish to be confined to one place when playing can opt for the mobile version of this casino. License provision plays a crucial role in lending credence to the legitimacy and authenticity of an online casino. SlotsMagic Casino operates with permits from the UK Gambling Commission and Malta Gaming Authority. These two regulatory bodies are among the most trusted in the gambling industry. Laws made by the control body covers all the areas of casino operations giving priority to regulations that protect players from being exploited in any way by virtual gaming sites. Fairness of games is affirmed through inspections conducted by independent audit firms. The RNG certified seal found at the foot of the website includes information about recent audits conducted on the games. Players who need further information on games RTPs can contact the casino and request for the data they need. When gaming online, players may encounter challenges which may be hard for them to fix on their own. The customer service team available in an online casino help such players by guiding them through their problem. The customer service team at SlotsMagic is available for twenty-four hours a day to answer questions and help clients resolve any issues that they may be encountering. The FAQs section is another place where gamers can get help if they do not wish to contact support. SlotsMagic uses SSL encryption technology to make sure that sensitive information shared by players is kept away from unauthorised third parties. Data such as bank details, passwords, and personal details are among the ones being protected by this system. Gamers can find conversion rates for any of the permitted currencies and convert what they use in their country of residence. Players should go through the list of restricted countries before they sign up to make sure that the nation they reside in is allowed to play. 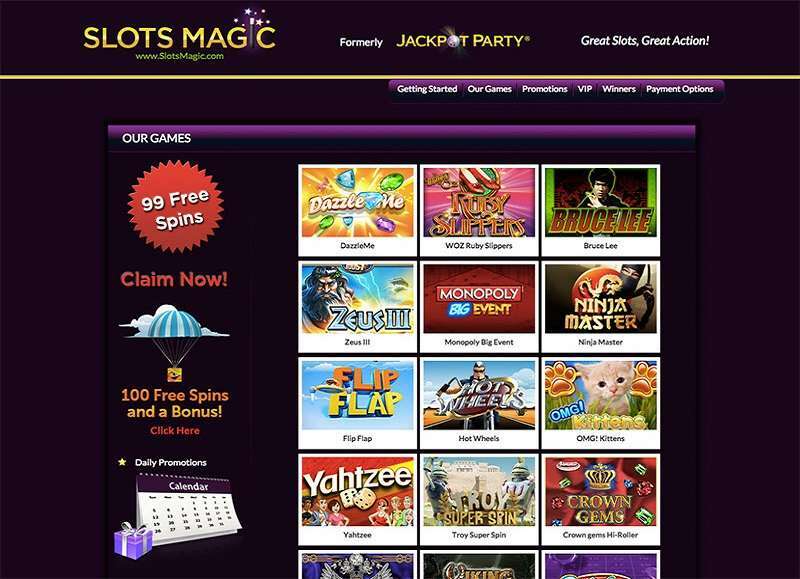 SlotsMagic play online features interactive gaming which keeps players interested in playing for an extended period.